FREE performances! The Treblemakers will perform several songs from our hit revue as you shop at the bookstore! Come out, buy a book (or more than one!) and enjoy the music as you shop! (Next to the Earle Theater.) Proceeds from this bookshop go to the Friends of the Public Library. Admission: $10.00 Tickets at the door! 232 Newsome Road - King, NC | Click for directions. See Our Promo for Feelin' Groovy - Click below! The Sixties are back! Join the NoneSuch Playmakers' all-girl vocal group "The Treblemakers" as they perform some of the top pop hits from 1964 to 1969 in "Feelin' Groovy," our new music revue! Hear classics by The Monkees, The Beach Boys, Martha and the Vandellas, The Beatles, The Fifth Dimension, The Mamas and The Papas and many more! 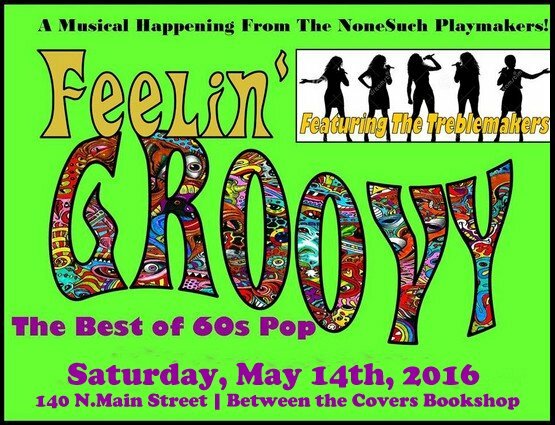 Our music revues are always great, but "Feelin' Groovy" will make NoneSuch history! Dates and locations are still in the works. Stay tuned in to our Facebook page and keep watching our website for more info. It's gonna be far out, man! Plus - our tribute to the late David Bowie! 95 Performance, Cast, & Rehearsal Photos!